I came across this handy python script https://github.com/reorx/httpstat that provides a http response breakdown in text. This saves you having to open up a browser and look at a visual network response waterfall. For example, using my website homepage and blog for comparision. Note that 301 redirects are not handled so be sure you are getting the full content you expect in a request. To focus on just one point for OTN appreciation day on October 11 2016 and to the benefit of all users of MySQL is to consider the extremely convenient and rich value of information available in the MySQL Performance Schema to understand what SQL queries are running in a MySQL instance now. The MySQL Performance Schema in MySQL 5.6 is enabled by default, (performance_schema=on). The following one off SQL statement will enable the instrumentation of SQL statements in the most detailed level of assessment. The following query will show you the longest running queries in your database at this present time. This ease of accessing what is running in a MySQL instance replaces many different and creative techniques as I describe in Improving MySQL Performance with Better Indexes in versions of MySQL before version 5.6. If your organization does not have dedicated performance experts reviewing new functionality consistently and monitoring your production systems regularly for database optimization, the cost of having the MySQL performance schema available and with a large number of different forms of instrumentation out ways any reason not to. Why I wrote this appreciation? On Friday I was asked to review the MySQL performance and load of a newly developed product during simulated tested. When I was first given access to the MySQL database server I was very disappointed that for a new and unreleased product the MySQL version chosen was 5.5. This is in no way disrespectful for the great stability, functionality and features of MySQL 5.5, however for any new system under development MySQL 5.6 and MySQL 5.7 are both much more appropriate options for many reasons. If for no other reason to look at upgrading to at least MySQL 5.6 to enable you to become a better expert with this functionality is one key consideration. This post format was suggested by Tim Hall, a well known community champion among Oracle users, who maintains a rich web site of news and free technical info. According to his suggestion, this post wants to add to the OTN appreciation day, a distributed community effort to show something useful, or pleasant, or both related to the Oracle world. For those not used to the Oracle Technology Network (OTN), it is the center of Oracle technology, the place where users can get all software (proprietary or open source) and other resources related to Oracle products. In the image below you may find several familiar names. MySQL Group Replication (GR) is a virtually synchronous replication solution which is an integral component of MySQL InnoDB Cluster announced at the MySQL keynote. You can download a labs version of MySQL InnoDB cluster which includes three components. While included as part of MySQL InnoDB cluster, MySQL Group Replication can be run standalone. It is a plugin, made by and packaged by MySQL. With the plugin architecture in MySQL 5.7 the ability to release new features is greatly reduced from the more typical 2+ year general availability (GA) cycle. Plugins also allow for functionality to be not enabled by default therefore preserving the stability of an existing MySQL instance running version 5.7. This is a change in the philosophy of new functionality that I discussed in Understanding the MySQL Release Cadence which in 5.7.13 introduced the SQL interface for keyring key management. Not all in the community are happy however I consider it an important requirement for time-to-market in a fast paced open source data ecosystem. MySQL GR is based on Replicated Database State Machine Theory and uses Paxos for evaluating consensus of available nodes in the cluster, being referred to as the Group Communication System (GCS). This is one key difference with Galera as the Paxos approach relies on accepting the certification stage within the cluster after a major of the nodes have acknowledged, rather than all nodes. MySQL GR is supported on a wide range of platforms including Linux, Windows, FreeBSD and Mac OS X, another difference with Galera. The current Release Candidate (RC) version of MySQL Group Replication has some required configurations and some situations for applications that may not be ideal use cases for a synchronous solution. There is the complexities in the migration process of any existing infrastructure to considering MySQL Group Replication, which has at a minimum requirements of MySQL 5.7, GTID’s and row based replication. I would like to see MySQL put a lot more effort into the education and promotion of MySQL migrations from older versions to the current MySQL 5.7. Ideally I’d like to see better tools starting with MySQL 5.0 which I still see in production operation. Something you can now do dynamically and persist in MySQL 8.0 using the SET PERSIST syntax. In subsequent posts I will look into more of the detail of setup and monitoring of a cluster with performance_schema. I hope that existing monitoring tools will also start to support monitoring Group Replication. As the author of the New Relic MySQL Plugin in 2013 I may need to get motivated to offer a SaaS solution also. You can find more information with official blog posts on MySQL Group Replication. MySQL 8.0.0 introduces three new miscellaneous UUID functions of IS_UUID(), UUID_TO_BIN() and BIN_TO_UUID() joining the UUID() (in 5.0) and UUID_SHORT() (in 5.1) functions. See 8.0.0 Release Notes. Thanks to the great work and hosting by Marcus Popp anybody can test out the SQL syntax of MySQL 8.0.0 using db4free without installing anything. If you want a minimal install Giuseppe Maxia provides docker minimal images of 5.0+ versions including 8.0.0. The following script shows the usage and checks of these new functions. Historically, to encode a UUID into a BINARY(16) datatype was to use UNHEX(REPLACE()) syntax. There was however no easy to unencode a BINARY(16) into the original value. BIN_TO_UUID() as shown in the output below solves this problem. The MySQL keynote at Oracle Open World 2016 announced the immediate availability of the MySQL Cloud Service, part of the larger Oracle Cloud offering. You can evaluate this now with a trial copy at cloud.oracle.com/mysql. MySQL server product manager Morgan Tocker gave two presentations at the event including a deep dive session. This is the first release of the MySQL cloud service. As with all first releases there are some highlights and some pipeline features. All major cloud providers have MySQL offerings. AWS RDS (traditional, MAZ and Aurora) GCP Cloud SQL and Azure MySQL App Service. Users of OpenStack have Trove for comparison. I am not going to be evaluating features between cloud offerings in this post. The differentiating highlights as I see them from the presentation. I will provide a followup blog on actual usage at a later time. SSH access is a non-privileged user (opc). This shows and intention on security first policy. Overall an A effort on paper in V1 with the willingness to be useful, sane and flexible. In a future post I will evaluate the actual MySQL cloud capabilities with the available trial. Features and functionality I see missing from V1 during this presentation. Some are features I would like to see, some are just observations, and some are likely present features but not discussed. I will leave it up the reader to decide which is which. Separated MEM configuration and management. See my later thoughts on this. An ability to define MySQL configuration templates (e.g. dev, test, prod, master, slave etc) and be able to select these for a new instance deployment. You can of course manage this after the fact manually. The compute workloads are more generic at present. There appears to be no optimized disk, network or CPU variants. Only offering MySQL 5.7 is an adoption impediment. This requires any organization with applications that are not greenfield to have already migrated to MySQL 5.7. I can understand the long-term rationale view here, but I see it as a clear limitation for more rapid adoption. The MySQL Cloud Service takes the hard parts out of managing MySQL. This is deployed in the Oracle Public Cloud, leveraging the fault-tolerant regional deployments in place. This Database as a Service (PaaS) helps to remove those annoying pieces of administration including backups, patches, monitoring etc. Powered by MySQL 5.7 Enterprise edition (the only cloud provider to offer this), the cloud system version in use is identical to the downloadable on-premise version. The Cloud service offers an initially optimized MySQL configuration of my.cnf to begin with, i.e. improvements on 5.7 defaults, and has variety of compute workload sizes to choose from. Storage is a ZFS appliance, but there is no information on provisioned IOPS for intensive workloads. You can use the web interface or REST API endpoints to create, deploy and manage your cloud instances. The REST API endpoints were not demonstrated in this session. The predefined disk layout for storage is a very sane configuration. The Operating System (Oracle Unbreakable Linux 6 ) has a dedicated partition, (not part of sizing). There is a dedicated and throughput optimized ZFS LUN for data (what you size with the setup), a dedicated and latency optimized ZFS LUN for binary and InnoDB logs (which appears not initially sizable at present) and a dedicated ZFS LUN for backups. There is also a secondary backup storage capacity by default in Cloud Storage. The UI interface provides the capability to configure a MEM server and a MEM client. To conserve presentation time Morgan consolidated these into his initial demo instance. I feel there is room here to optimize the initial setup and to separate out the “management” server capabilities, e.g. selecting your MEM configuration, and by default offering just the MEM client authentication (if MEM server is configured). For users not familiar with MySQL Enterprise features separating the definition and management in the initial creation stage is an optimization to remove complexity. There may even be an option for a getting started quick setup step that can provision your MEM setup in a dedicated instance when there is none detected or with a new account. Here is the flip side. An inexperienced user starting out may launch a MEM server with several test instances because the initial UI setup offers these as input fields, this is not the goal when managing multiple servers. The current version of MEM shown was 3.2, with 3.3 planned. Version 3.3. includes it’s own web interface for backup management. Some things that are not in the initial release but I’m sure are on the roadmap. One is an upsize and downsize optimization. It would appear via the demo, that when a compute size modification occurs, the existing MySQL instance is shutdown and the VM is shutdown. A new VM is provisioned using the setup and disk partitions of the prior VM. An optimization is to provision a new VM, startup MySQL, then stop MySQL on new, stop on old, unmount on old, mount on new, and start MySQL. This removes the downtime in the VM provisioning step. Ideally I’d like to see the capability to perform this on a slave, and promote a slave more seamlessly. Practically however, this has many more moving pieces than in theory and so the future use MySQL router is a solution. The upcoming MySQL InnoDB cluster will also suffer from the complexity of resizing and uptime availability, especially when nodes are of varying compute sizes. As mentioned, I would like to see pre defined MySQL configurations. I would also like the option to pre-create multiple user authentications for instances, rather than having to specific one each time. I can see for a class of servers, e.g. a load test environment of a master/slave setup, and an application with several MySQL accounts, a means of bulk user and permission management. Under the Hood Morgan talked about the InnoDB IO configuration optimizations, the number of IO Threads, use of O_DIRECT, the redo log size and buffer pool optimized to compute shape. The thread pool is enabled by default. The same considerations are in place for the operating system, Oracle Linux 6 UEK, MySQL task priority, memlock, and ext4 filesystem. Again, those unfamiliar with MySQL Enterprise features will need greater help and UI help understanding the features, capabilities and configuration of Firewall, Encryption, Authentication, Audit, Monitor, Backup and Thread Pool. The SSH access is what gives this first release control to be flexible. You can modify the MySQL configuration, incorporate configuration management processes. You can utilize on system database restore capabilities. You can monitor physical resource utilizations. I am unsure of the total control of changing (or breaking the system and the kernel). There was a lot to digest in the 45 minute practical demonstration session. I am sure as with more reading and evaluation there will be more to share. As the roadmap for MySQL InnoDB cluster develops I can see there being a good cadence on new features and functionality released for the MySQL Cloud Service. Excellent in depth presentation of #MySQL Cloud service by @morgo at #oow16. Sane my.cnf defaults, SSH access, enterprise features. Giuseppe performed his demos on a dedicated Linux machine. My attempts to reproduce the tutorial steps on Mac failed, as mentioned because of issues with volumes. MySQL Group Replication with Docker on Mac is also unpredictable. In summary, Giuseppe talked about how wonderful Docker is for development and testing but not advisable for production. Some of the questions regarding production concerns included the inability working with orchestrators, stability with volumes and overall container user security. In addition, a tough audience question “How do you upgrade MySQL in production using containers?” highlighted that this technology is evolving, and while becoming ideal for stateless applications, it is not ready for primetime for databases that require state to operate. Get the Code Examples on GitHub. Docker has become a popular technology for containers starting in 2013. It did not invent containers, A Brief History of Container Technology gives a timeline of technologies that have got us to where we are today. #MySQL announces the Oracle MySQL Cloud service at #oow16 http://cloud.oracle.com/mysql offering 5.7 enterprise edition, on demand or per month. MySQL Enterprise Edition security covering authentication, encryption, firewall, auditing, backup and monitoring. MySQL Cluster 7.5 announcement, 128TB nodes, MySQL 5.7 features including JSON, generated columns. 20 years of constant improvements of MySQL as a relational database. MySQL is the #1 open source database for web-based applications. Used by 9 of the top 10 web sites. There were also user stories by Nicolai Plum – Senior Systems Architect at Booking.com and Andrew Archibald – VP of Development at Churchill Downs. Nicolai talked about how booking has evolved over the years starting with the traditional MySQL replication model, moving to a more complex sharded and partitioned architecture, and now a re-architecture towards a loosely coupled, write optimized and read optimized data model leveraging Redis queues. This work has enabled services to hide the complexity and need for developers to write SQL and leverage better data translation and interoperability, e.g. MySQL to Hadoop to MySQL. Booking.com is actively using MySQL 5.7, and is evaluating how to incorporate the new features of MySQL 8.0. Andrew talked about how twinspires.com uses a multi data center master-master replication setup with MySQL 5.6 to manage critical availability needs for online wagering of horse races around the world. During peak times, load can increase 100x, similar to my own experiences handling 100x flash sales Improving performance – A full stack problem. I have yet to discover how to deep link to this presentation at the OOW 2016 agenda to enable viewers to read the overview and speaker profiles. The following is the text from a presentation slide at Oracle Open World 2016. While Docker has been playing a key role in adoption of the Linux container Technology, the did not invent the concept of containers. DISCLAIMER: This post is only a repeat of the content of the slide and has not be verified for accuracy. Organizations are rapidly developing new software applications to meet the need to consume ever increasing digital content and maintain market share in a given field. These newly developed applications cover a wide range of needs from advanced data analytics, to mobile applications, to personalized recommendation engines. They utilize a new generation of languages, tools, frameworks, design approaches and software engineers to iterate rapidly. Many applications are being created without the foresight of the ongoing lifecycle management that is needed to manage this explosive growth. Organizations with existing information systems will need to support and integrate these products to maintain business viability. Like many pictures, this is just a snapshot. It does not represent what happens when you include the dimension of time. Regardless of the amount of time that passes between these two snapshots, what is important is the pace of development, i.e. the rate of change. If the goal is to replace a legacy system, the work on replacing the legacy system has to match and exceed the velocity of new development. The legacy dilemma is a needed integration in many organizations. Established monolithic applications contain great data wealth. Organizations that are not integrating are not leveraging some of the greatest assets available. There are a number of reasons why legacy applications are considered for replacement. The cost of licensing commercial software, the cost of running and supporting older hardware, the physical size and location of equipment, the decline and availability of skilled resources in older programming languages. What is important is to identify the strategic decisions why, and develop a roadmap that has the time, money and resources assigned to enable success. Organizations think and act in the intention of replacing legacy systems, but the plan rarely includes the detailed roadmap to completion. Solutions such as implementing a private cloud Infrastructure as a Service (Iaas) is a platform to support a system, not a plan to implement a migration or replacement. The purchased packaged application where customization is very limited and modification is not possible. The third-party supported application where customization is very expensive and very time consuming. The in-house application that while providing core features, is not actively developed. It may appear too complex or fragile to modify, or skilled resources are not available to improve functionality. How do you tackle the adoption of your legacy application data, logic and functionality? How do you develop a strategic roadmap for deprecation and replacement? For a purchased or third-party application your options to replace the system are generally limited to an entirely new product and the expensive and complex transition process associated with this. The choices are more limited. For an in-house application the solution can be more flexible, incremental and planned. No two organizational applications are the same. The process of analysis of any application is the same regardless. Systems accept data input and provide data output. The workflow to construct a data pipeline that encompasses the business logic and intellectual property of the organization for each input/output is the complex analysis set. What is visible to the end consumer, or to an administrative interface is often only a common path of data management. Only detailed documentation and code analysis enables you to identify all of the possible paths of data with specific business logic. This forensic analysis is more specific step for each particular application however the process can be repeated across applications. With an existing legacy application that includes data, logic and functionality, the approach to incorporate and replace will vary depending on business priorities. Here are two very different approaches to a starting point depending on strategic priorities. A business wants to personalize the products displayed to a user on their e-commerce site. What is needed is access to the data. Providing a means to migrate data (in near real time) to a different data source is needed. Providing a read-only interface to a subset of data does not require understanding of, modifying or adopting application logic. A business wants to offer a mobile application to purchase products available on their e-commerce site. Duplicating the website functionality in a mobile application to list and order products is a recipe for an inconsistent consumer experience and the duplication of development and maintenance resources. What is needed is a common API that the website and mobile application can consume to ensure there is one path of business logic to various workflows. This requires at minimum a refactoring of existing business functionality to enable different means of consumption. This does not modify the logic or data. There is often the temptation to re-write the logic at the same time, for example in a newer language, however this introduces multiple critical path factors. Planning the creation of an API is a very strategic approach to extending an existing system. After successful implementation using existing logic there can be a planned and successful refactoring overtime using newer technologies and no critical path dependencies. You have an e-commerce site that processes credit card payments. Moving the payment processing from a synchronous operation; i.e. you make a request to a payment processor and you wait for a response to proceed; to an asynchronous operation means this can component can scale because this new design can incorporate queueing and throttling. In the workflow of an order, an existing system is still used to place an order. A new service is created to process placed order and determine if payment is accepted or rejected. The existing application is used for fulfillment of accepted orders. This provides several additional benefits. You improve the customer experience in waiting during the ordering process. You reduce the impact of a failure point in the lifecycle of the customer experience. You provide a gated step that can be independently scaled to avoid any critical stress for system overloading. In addition, the ability to add redundancy via means of an alternative payment gateway when your primary gateway is unavailable resolves an import single point of failure (SPOF). When your business relies on a service provider to conduct important aspects of your business and the only means to know of outages is to see complains on social media, you should be proactive in your business resilience independently of a third party. The look verses book capacity of online travel, hotel reservations and events management. By utilizing different technology stacks for the look functionality that needs to scale more significantly, you can reduce loss of service, and still utilize a proven means of processing actual orders. The process of consolidating email communication that is spread throughout an application and integrate with a service provider. By removing in-house and at times specific hard-coded response, you can leverage tools that enable staff to customize response for consumer, create additional communication campaigns and track usage by consumers. Separating content creation from application development. When tools are used to enabled staff to manage text on a website rather than a developer needing to program a change and rely on the release management process, you enable software developers to focus on functionality rather than text changes. These examples demonstrate the concepts to tackle reducing a large application by replacing smaller pieces of functionality with a strategic plan. As with many cliches about eating elephants and climbing mountains, there has to be a focus on the end goal, while achieving the goal with small manageable steps. Identifying the server product options covering community, enterprise and ecosystem. Describe MySQL enterprise products, features and support options. Describing the DMR, RC, GA, EOL and labs product lifecycle. Discussing the GA release frequency. Talking about the MySQL Upgrade path. As your organization transforms to embrace the wealth of digital information that is becoming available, the capability to store, manage and consume this data in any given format or product becomes an increasing burden for operations. How does your organization handle the request, “I need to use product Z to store data for my new project?” There are several responses I have experienced first-hand with clients. Enforce the company policy that Products O and S are all that can be used. Consider the request, but antagonize your own internal organization with long wait times (e.g. months or years) and with repeated delays to evaluate a product you simply do not want to support. Do whatever the developers say, they know best. Unfortunately I have seen too many organizations use the first three options as the answer. The last option you make consider as a non valid answer however I have also seen this prevalent when there is no operations team or strategic technical oversight. Ignorance of the question only leads to a greater pressure point at a later time. This may be when your executive team now enforces the requirement with their timetable. I have seen this happen and with painful ramifications. With the ability to consume public cloud resources with only access to a credit card, development resources can now proceed unchecked more easily if ignored or delayed. When a successful proof of concept is produced this way and now a more urgent need is required to deploy, support and manage, the opportunity to have a positive impact on the design decision of a new data product has passed. This is the strength of DBaaS. Operations can enable development to independently provision resources and technology with little additional impeding dependency. There is input from operations to enable varying products to be available by self servicing, however there is also some control. DBaaS can be viewed as a controlled and flexible enabler. A specific example is an organization that uses the MySQL relational database, and now a developer wishes to use the MongoDB NoSQL unstructured store. An operator may cringe at the notion of a lack of data consistency, structure data query access or performance capabilities. These are all valid points, however those are discussions at a strategic level discussion your workflow pipeline and should not be an impediment to iterate quickly. Without oversight, to iterate quickly can lead to unmanageable outcomes. There always needs to be oversight combined with applicable strategy. A single developer stating they want to use the new product Z for a distribution key/value store needs to be vetted first within the engineering organization and its own developer peers. If another project is already using Product Y that has the same core data access and features, this burden of an additional product support should be a self contained discussion validating the need first. The backup ecosystem, time taken, consistency, point-in-time recovery, testing and verification, cost of H/W, S/W, licenses. Capacity planning and cost analysis of storing and archiving ever increasing sources of data. Two way communication which is often overlooked is the start of better understanding. That is, operations being included and involved in strategic development planning, and engineering resources included in operations needs and requirements for ensuring those new product features operate for the benefit of customers. In summary, “bridging the communication chasm”. DevOps is an abused term, this implies that developers now perform a subset of responsibilities of Operations. As an individual that has worked in both development teams and lead operations teams, your resources skills, personality, rational thinking and decision making needs are vastly different between an engineering task and a production operations task. Developers need to live a 24 hour day (with the unnecessary 3am emergency call) in the shoes of an operator. The reverse is also true, however the ramifications to business continuity are not the same. Just one factor, the cost, or more specifically the loss to the business due to a production failure alters the decision making process. Failure can be anything from a hardware or connectivity problem, bad code that was released to a data breach. If an organization has a strong (and flexible) policy on release criteria, all parties from the stack-holder, executive, engineering, operations and marketing should be able to contribute to the discussion and decision for a new product, and applicable in-house or third-party support. This discussion is not a pre-requisite for any department or developer to iterate quickly, however it is pre-requisite to migrate from a proof-of-concept prototype to a supported feature. Another often overlooked criteria in the pursuit for rapid deployment of new features which are significantly more difficult to remove after publication. I was surprised to find on one of my websites the message “Connect failed: Your password has expired. To log in you must change it using a client that supports expired passwords. Not knowing that I was using a MySQL password expiry policy I reviewed the 5.7 documentation quickly which *clearly* states “The default default_password_lifetime value is 0, which disables automatic password expiration.”. I then proceeded to investigate further, my steps are below the following comment. However, it is always important with MySQL documentation and a new feature (in this case a 5.7 feature) to review release notes when installing versions or to least read ALL the documentation, because you may miss important information, such as. I would encourage you to view the MySQL password expiry policy to see the full note. I have only include the intro here are a teaser, because you need to read the entire note. Back to impatient analysis steps. Indeed there are some passwords that have expired. After finding the applicable application credentials I looked at verifying the problem. Interesting, there was no error to make a client connection, however. I then proceeded to change the password with the applicable hint shown. I chose to reuse the same password because changing the password would require a subsequent code change. MySQL accepted the same password. (A topic for a separate discussion on this point). A manual verification showed the application and users operating as it should be, so immediate loss of data was averted. Monitoring of the sites home page however did not detect this problem of a partial page error, so should a password expiry policy be used, an applicable check in a regularly scheduled operational task is a good feature request. All of this could have been avoided if my analysis started with reading the documentation and the note (partly shown above) which has an alternative and potentially more practical immediate solution. In a firefighting operational mode it can be a priority to correct the problem, however more detailed analysis is prudent to maintain a "Being proactive rather than reactive" mindset. Being a Friday, I feel the old saying "There is more than one way to skin a cat" is applicable. I am also more familiar with the SET PASSWORD syntax, so reviewing this 5.7 manual page is also a good read to determine what specific syntax is now deprecated and what "ALTER USER is now the preferred statement for assigning passwords" also. “The cosmos is complex, the cloud does not have to be”. This quote by Ben Amaba, Worldwide Executive at IBM Cloud, early in his presentation at the Performance without Limits 3.0 on IBM Cloud event was his introduction to what I interpreted as stepping back from “what do I do with the cloud?” to consider “what makes my business successful?”. Indeed “the cloud”, i.e., Infrastructure as a Service (IaaS), should not be the complicated component in your business strategy. The realization is that today, digital information exists and its growth is accelerating exponentially. Any strategy to embrace this need is essential to maintaining business success. This implies that to achieve transformation, your business has to include using available and potentially un-thought-of digital information to innovate and personalize. The present traditional approach towards provisioning resources and services simply cannot meet this need. Hence the adoption of “utilizing the cloud” is becoming the ubiquitous answer. The business model that one develops for maximizing this infrastructure-on-demand needs to be a provable, reproducible, resilient and a flexible reference architecture. It needs to have set principles to embrace the potential of the cloud. It needs to minimize the potential of failure. As we consider digital transformation strategies, just understanding the potential capability of a hybrid structure is required. This will vary from organization and industry and will rely on a balance of private and public cloud services. Locking your organization into an all public cloud solution (e.g. AWS), or an all private cloud solution (e.g. all VMWare) limits your capacity to adapt. Implementing an on-premise cloud infrastructure that leverages OpenStack to replace existing propriety off-premise cloud providers such as AWS, Azure and Google Cloud is not the ROI you should hope for. Indeed a hybrid private/public strategy with the capacity to enable greater access to applicable and real-time data and tools, providing the ability for your employees, associated researchers, strategic partners and even individuals via a foldit gamification type approach all increase the innovative transformation that can ensure your company is the disruptor, not the disrupted. Let’s consider a theoretical example when a hybrid cloud strategy enables the capacity for innovation to occur in record time. CERN announces the release of 300TB of LDR data. If this was released into one specific cloud infrastructure, could your organization support that? For example, if this was the SoftLayer cloud infrastructure, leveraging the compute resources of this cloud provider would be beneficial to your internal organization because one feature of this cloud is that it includes free data transfer across the entire worldwide network. This one feature on a specific cloud has an immediate cost-benefit. Not being capable of expanding your organizations authentication, intellectual property analysis engines, and tools to quickly and seamlessly cater for the data could also be a competitive disadvantage. Amaba noted that 1/3 of top companies will face disruption in the next few years. Disruption is not limited to a competitor, a customer or a supplier. It can include the lack of ability to adapt timely to opportunity. Is being able to utilize any public cloud rather than one specific public cloud included in your business process? Could your internal global infrastructure and network support an additional 300TB of data immediately? While this is a specific use case, the availability of data and the ability for your organization’s employees to consume, digest and analyze is a digital strategy you need to be prepared for to compete in speed and innovation within your industry. Is the source of new data for your organization an opportunity or a problem? The discussion of whata hybrid cloud is and how does my organization cater for and uses a hybrid cloud is the reason that thought leadership is needed. To understand the enterprise architecture of legacy systems, the capacity of new cloud-native applications and the huge divide in transition between these to enable utilization of existing data-wealth must also be part of your transformation strategy. Amaba’s presentation also included discussing the discipline of needing to ensure and provide consistency. This ranges from the varying views of information to your consumers to the choices for workload assignment and access. Analytics was the third principle that encompassed the capability to determine insights, from using big data analysis to cognitive computing. These thoughts are a reflection on the few notes taken at the time. I am really looking forward to seeing the slides and video presentation to fully reflect and comment in more detail. are you running KVM or QEMU launched instances? A recent operators mailing list thread asked this question regarding the OpenStack user survey results of April 2016 (See page 39). As I verified my own local multi-node devstack dedicated H/W environment with varying commands, I initially came across the following error (which later was found to be misleading). This is an attempt to collate a list of varying commands collected from various sources, and the output of these in my Ubuntu 14.04 LTS environment. # Can I use KVM? All of the above is the default output of a stock Ubuntu 14.04 install on my H/W, and with the correctly configured Bios (which requires a hard reboot to verify, and a camera to record the proof). Some more analysis when changing the Bios. When running a VirtualBox VM, the following is found. Now checking my OpenStack installation for related KVM needs. Devstack by default has configured libvirt to use kvm. Spinning up an instance I ran the following additional checks. Information from the running VM in my environment. So, while the topic of the ML thread does indeed cover the confusion over OpenStack reporting the hypervisor type as QEMU when infact it does seem so but is enabling KVM via my analysis. I find the original question as a valid problem to operators. And finally, this exercise while a lesson in understanding a little more about hypervisor and commands available, the original data was simply an operator error where sudo was needed (and not for other commands). You have setup and installed devstack. Now what! The Horizon UI will allow you to administer your running cloud from a web interface. We are not going to discuss the web UI in this post. Using the command line will provide you access to the following initial developer/operator capabilities. This is not an exhaustive list or explanation of each point but an intro into navigating around the running OpenStack services. OpenStack has a number of individual command line clients for many services, and a common client openstack. By default you will need to provide applicable authentication details via arguments or environment variables. Using the output of the devstack setup, we can obtain applicable details needed for most parameters. The openstack command provides a --help option to list the available options. You can also inquire as to commands with the command list option. With the openstack command line interface you can perform all the operations needed to configure, administer and run your cloud services. OpenStack is made up of a number of services, those key services in devstack start with nova, keystone, glance, cinder and horizon. devstack conveniently packages the individual running services into separate screen processes, leveraging a cursors based view of services via the output of log files. You can view the running screen sessions by reattaching with. Commands in screen are driven by a key combination starting with ^a (ctrl-A). ^a d will detach from your screen session you just reattached to. This is what gets you out of screen. See the later section for the full list screen help commands. On the command line you can run the following command to list the available images via the glance service. Within screen you can look at the glance api screen log (^a 5) and can observe the logging that occurs in relation to this command. For example we can see an INFO message to get the images (GET /v2/images), and we can see several DEBUG messages. We will use these DEBUG messages in a later post to describe handling logging output. In order to page back in screen output, you enter copy mode “^a [” and then you can use ^b (page back) and ^f (page forward) keys. What is actually observed in the screen output is what is being logged for the Glance API service. We can verify this with the log file logged in /opt/stack/logs. NOTE: You may see that there are colors within both the screen and log output. This is an optional configuration setup used by devstack (not an OpenStack default for logging). We will use this later to show a change in the logging of the service. We can verify the details of the command used within the screen session (^a 5) by killing the running process with ^c. Using the bash history, you can up arrow to observe the last running command, and restart this. /usr/local/bin/glance-api --config-file=/etc/glance/glance-api.conf & echo $! >/opt/stack/status/stack/g-api.pid; fg || echo "g-api failed to start" | tee "/opt/stack/status/stack/g-api.failure"
The actual log file is produced by the screen configuration defined in devstack/stack-screenrc. In a running OpenStack environment you would configure logging output to file as per the log_file option. This command indicated a configuration file /etc/glance/glance-api.conf. Glance like other services may contain several configuration files. These are by default defined in the individual projects namespace under /etc. This is an appropriate time to point to several documentation sources including the Glance Developer Documentation – Configuration Options and the Configuration Guide Image Service options which describe in more detail these listed configuration files and the possible options available. You can find similar documentation for other services. To demonstrate just how the configuration and logging work with a running service the following will modify the logging of the Glance API service by commenting out the logging configuration lines, and then reverting to the oslo.log configuration defaults. Comment out the four logging_ options in the [DEFAULT] section. Now, repeating the earlier steps within the g-api screen window, kill and restart the service. The first thing you will observe is that the logging no longer contains color (this helps greatly for log file analysis). Repeat the CLI option to list the images, and you will notice a slightly modified logging message occur. The request context now is a modified format (containing additional - - - values) as a result of using the default value of logging_context_format_string. We will discuss the specifics of logging options in a later post. There are a reasonable number of log files for a minimal devstack installation, some services have multiple log files. To turn off color in logging across service, you can configure this in the devstack local.conf file before starting the stack. devstack installs the OpenStack code in two ways, via packaging and via source. This is a list of all Python packages so it’s not possible to determine which are OpenStack specific, and which are dependencies. These installed packages are actually Python source that you can view and even modify. devstack enables you to configure which packages you want to install via source. Checkout plugins for more information. For example, the following added to the local.conf would install solum. You have complete flexibility of which branch and version of each package using devstack. This enables you to use devstack as a testing tool for code changes. At this time to understand more about how software is installed check out devstack documentation and review the stack.sh script. This is only a cursory introduction into what devstack sets up during the installation process. Subsequent posts will talk more on topics including the configuration options, the different logging capabilities and how to test code changes. ^a ? will provide the following help output. If you have a system with only 4GB of RAM, you need to assign at least 2.5GB (2560M) to a virtual machine to install devstack. Even with this limited RAM there are times the devstack installation will fail. One way to give the installation process an opportunity to complete is to configure your virtual machine to have swap space. The amount of swap space you can configure may be limited to the size of your initial disk partition configuration (which is 8GB). The following steps add a 2GB swap file to your virtual machine. The use of swap space by your virtual machine instead of available RAM will cause a significant slowdown of any software. For the purposes of a minimal installation this option provides a means to observe a running minimal OpenStack cloud. The following instructions assume you have a running Linux virtual machine that can support the installation of devstack to demonstrate a simple working OpenStack cloud. You will need to login to your Linux virtual machine as a normal user (e.g. stack if you followed these instructions). NOTE: This assumes you configured a second network adapter as detailed. Verify that you have applicable sudo privileges. If you are prompted for a password, then your privileges are not configured correctly. See here. The following will create an example configuration file suitable for a default devstack installation. NOTE: If your machine has different IP address you should specify this alternative value. Depending on your physical hardware and network connection, this takes approximately 20 minutes. While the installation of devstack is happening, you should read Configuration section, and look at the devstack/samples/local.conf sample configuration file being used. You now have a running OpenStack cloud. There are two easy ways to access the running services to verify. Connect the Horizon dashboard in your browser with the URL (e.g. http://192.168.56.101/), and use the user and password described (e.g. admin and nomoresecrete). See Using your devstack cloud for more information about analyzing your running cloud, restarting services, configuration files and how to demonstrate a code change. There are some useful commands to know about with your devstack setup. To shutdown a running devstack. To cleanup your VM of devstack installed software. NOTE: There are several different ways in creating a base VM CentOS image. These steps are the more manual approach, however they are provided for completeness in understanding varying options. Use the default settings including 8.0GB, VDI type, dynamically allocated, File location and size. By default your virtual machine is ready to install however by making the following network recommendation it will be easier to access your running virtual machine via SSH and the RDO web interface and APIs from your host computer. You are now ready to install the Operating System on the virtual machine with the following instructions. Open the CentOS .iso file you just downloaded. You will be prompted for a number of options, select the default provided and use the following values when prompted. When the installation is complete, click Reboot. You will now be able to login with username: rdo and password: Openstack (or the values you chose). While the second ethernet adapter for your VM is configured it is not enabled. The ip output will verify the IP address that was assigned. If you configured the VirtualBox host-only adapter with defaults, the address will be 192.168.56.1XX. Hot of the press are our Oslo stickers for the Austin event. 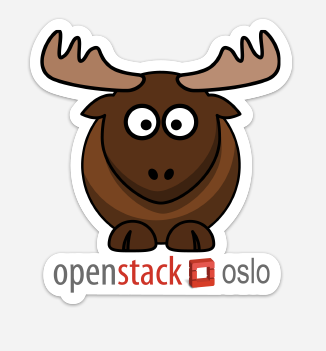 Be sure to track down an Oslo core, answer the magic question and add this to your conference swag. As discussed, devstack enables a software developer to run a standalone minimal OpenStack cloud on a virtual machine (VM). In this tutorial we are going to step through the installation of an Ubuntu VM using VirtualBox manually. This is a pre-requisite to installing devstack. NOTE: There are several different ways in creating a base Ubuntu VM image. These steps are the more manual approach, however they are provided for completeness in understanding varying options. You will need a computer running a 64 bit operating system on Mac OSX, Windows, Linux or Solaris with at least 4GB of RAM and 10GB of available disk drive space. You will need to have a working VirtualBox on your computer. See Setting up VirtualBox to run virtual machines as a pre-requisite for these steps. You will need an Ubuntu server .iso image. Download the Ubuntu Server 14.04 (Trusty) server image (e.g. ubuntu-14.04.X-server-amd64.iso) to your computer. This will be the base operating system of your virtual machine that will run devstack. NOTE: devstack can be installed on different operating systems. As a first time user, Ubuntu 14.04 is used as this is a more common platform (and used by OpenStack infrastructure). Other operating systems include Ubuntu (14.10, 15.04, 15.01), Fedora (22, 23) and CentOS/RHEL 7. If you have 8+GB use 4GB. By default your virtual machine is ready to install however by making the following network recommendation it will be easier to access your running virtual machine and devstack from your host computer. Open the Ubuntu .iso file you just downloaded. The new virtual machine will now restart and you will be able to login with the username and password specified (i.e. stack and Openstack). After successfully logging in run the following commands to complete the Ubuntu installation setup needed as pre-requisites to install devstack. You are now ready to download and install devstack. You can also setup an Ubuntu virtual machine via vagrant which simplifies these instructions. This blog is a series for the software developer with no experience in OpenStack to experience just the tip of functionality and features to become more interested in the project.